Freemen of Maryland ! The time is rapidly approaching when you will be called upon to decide through the ballot-box the most momentous issue, ever submitted to the voters of this Commonwealth. Are you prepared to meet it as becomes freemen ? Are your forces well disciplined, and is every man at his post ready for the struggle—a struggle which is to decide whether Freedom or Slavery is to rule Maryland -a struggle which is to decide whether her vast elements of greatness shall be developed by Free Labor, or whether they shall continue to slumber in the embraces of a system at war with republican institutions, and which has ever cursed the soil that has nurtured it. Let every man who can work be at his post, and let everything be done which human power is able to accomplish to shake off the thraldom of slavery, and place Maryland among the great, prosperous, Free Labor States of the North. Allow no man to remain at home who has a right to vote. The enemies of the Republic are employing every instrumentality at their command to defeat you, and are secretly marshalling their forces for the contest. Shall they triumph? Or are you ready to meet the issue as true patriots, as becomes the friends of a cause which involves the prosperity of generations to come. 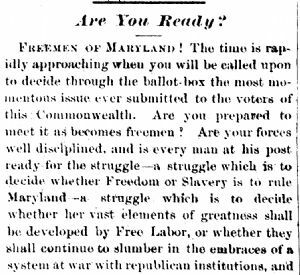 We believe that there is too much patriotism in the hearts of the honest voters of Maryland to permit the allies of treason to triumph at this hour, when victory in the ensanguined field is so proudly perching on the venerated flag of our fathers. The prize is worth contending for, but if you sleep at your posts all is lost. Let every man be on his guard ! See that the infirm and careless deposit their votes, and let Old Washington County give an overwhelming majority in favor of the New Constitution, on the adoption of which Maryland will enter upon a career of prosperity unknown in her history.